Kevin Tran and Amelia's birthdays and more! Firstly, yes, Supernatural has indeed done the "soap-opera year" and despite being "one year later", it is still somehow 2012. 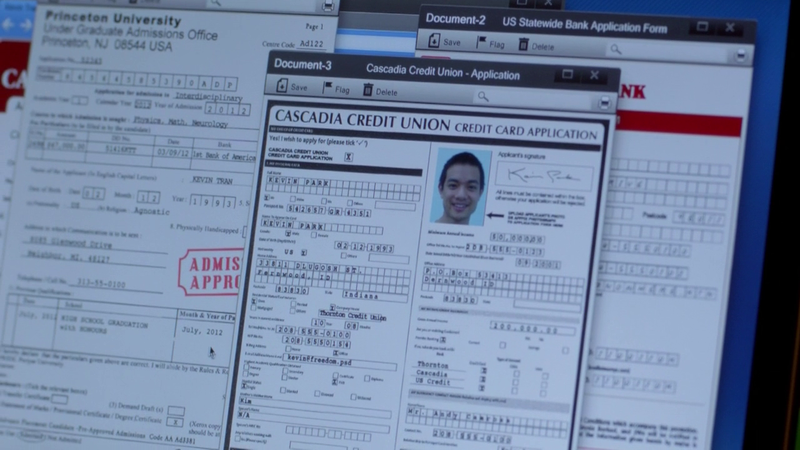 Secondly, Kevin Tran's date of birth is December 2nd 1993, making him nearly 19 years old, which is actually a little old to be starting university, isn't it? Maybe he did an extra year of kindergarten like yours truly...all the smart kids do it, I hear which is exactly the right age to be starting university, good job, Kevin! Kevin is also an Agnostic, and he's using a credit card under the pseudonym Kevin Park. 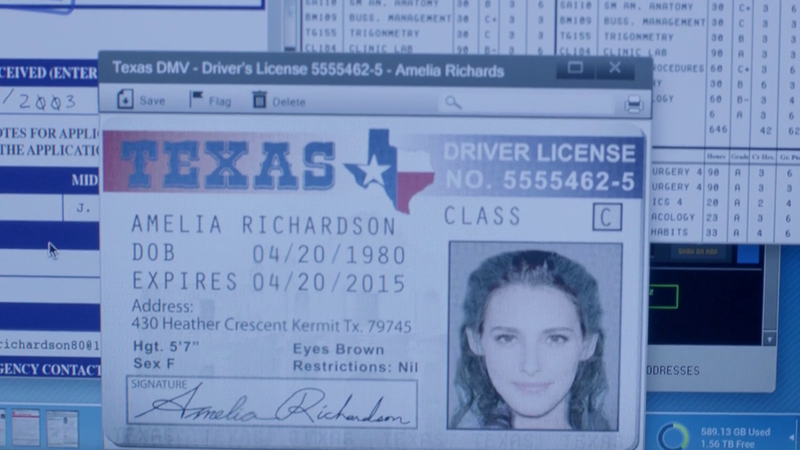 We also get to find out Amelia's DOB: April 20th 1980, making her three years older than Sam. I started university at 19, but then I did that "extra" year in CEGEP, which I think is essentially the equivalent of freshman year in university. I wish SPN would pick a name other than "Amelia" for its female characters from now on. I blame Carver. He's the one who seems to like the name. It's the third time he's used it. Yeah, I wish they'd choose another name too. :P There are so many to choose from. Is Kevin 19 after the year he's basically spent on the run? Because if he's 19 NOW, after Dean's Purgatory year, then when he was applying to college, he would have been 18. Right? Seriously? Boo. I really liked my hypothesis concerning 2014!Dean of 5x04 and 2014!Dean of S8. Not that there was much to it, I haven't seen 8x03 or later, but it was definitely an intriguing hypothesis and I liked it. Year between S5 and S6 plus year between S7 and S8 equals 2014, so. 19 kind of makes sense if his birthday's in december, I think, because of grade cut-off dates. And even beyond that, there's a friend of mine who is six months younger than I am, but she graduated from college in 2008 as opposed to my 2006. Hmm, let me think about this. Being born in December, he wouldn't have started kindergarten in 1998, because of school cut off dates, which means he would have started in the fall of '99. (Urgh, I'm old. I was in my second year of high school). And that means he graduated high school in June 2012, if I'm doing my math right, meaning he'd be starting college right before his 19th birthday. Ta-da! I will correct the post! Good call, but it's definitely December - look at the left-hand side of the screen at the college application/admission form - the birthday is listed as Date: 02 Month: 12 Year: 1993. Haha okay, that makes sense! Silly Canadians ;) I totally missed the other date, sorry about that. I almost wondered if they back tracked on Kevin's age on purpose so he would be an adult because then they could kill him if needed without killing a minor. They seem squeemish about harming minors. How would it be if Crowley cut a "kids"finger off. Kevin's birthday works in the US. Most schools have a cut off around December first. So Kevin would have started Kindergarten at 5 and turned 6 soon after. They're idiots with the dates. Clearly Kevin is a year older, but, it's still 2012! As far as I'm concerned its 2014. I'm sure they purposefully made Kevin 18+ - I mean, I think Osric is 26 or something ridiculous, but it also gives them more range of storyline...not just for potentially killing him, but for torture (as you point out) and also for any romantic storyline they might want to give him. It just gives them more freedom. I'm guessing that Samandriel is also riding around in an 18 year-old for that reason too - though they haven't confirmed that. As far as I'm concerned as well it's 2014. It's not like they actually reference current events (besides the entertainment industry) so I don't see why they insist on keeping the Winchesters in the our present. The other reason of Kevin's age could be that kids after a certain part of the year are not allowed to start school until the following year. So he might have started in kindergarten when he was 5 going on 6. Yup, I'm sure that's what happened. It's not too out of the ordinary to start first grade when you're already six years old.